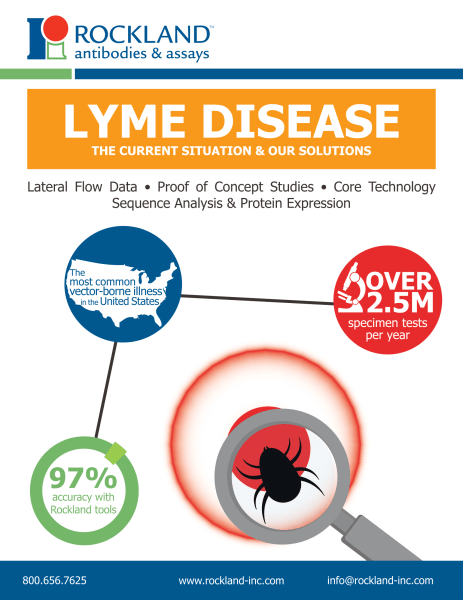 For over 50 years Rockland has provided a dedicated portfolio of general purpose reagents (GPR) used to collect, prepare, and examine specimens for a broad range of diagnostic applications. These include anti red-blood cell antibodies, secondary antibodies, gamma globulins, buffers, stabilizers, diluents and substrates. 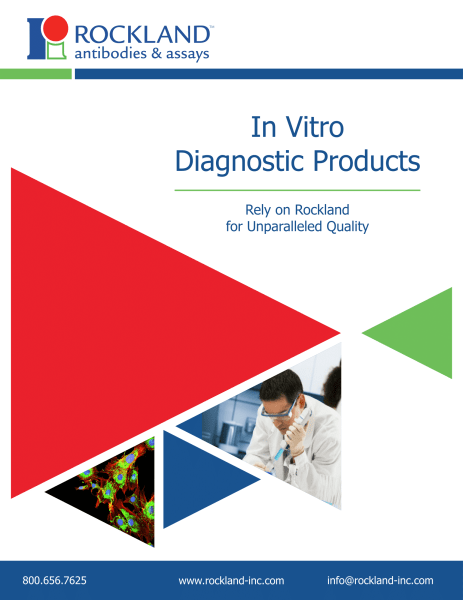 Similarly, Rockland has produced and validated monoclonal (MABs) antibodies against biomarker proteins that can be used as analyte specific reagents (ASR) and are available for licensing. Areas of research include cancer, apoptosis, neurobiology, immunology, cardiovascular disease, infectious diseases and epigenetics. Released July 2017. PTM antibodies target the chemical changes on proteins, DNA and RNA as a result of an covalent attachment. 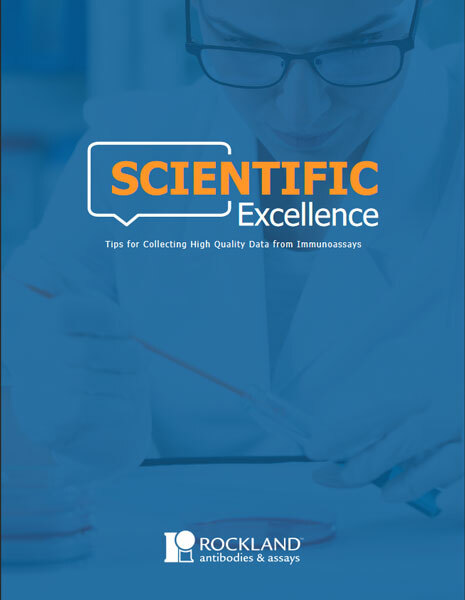 PTM antibodies can also be used to identify and purify protein-protein, protein-DNA and/or protein-RNA complexes containing the modified protein. 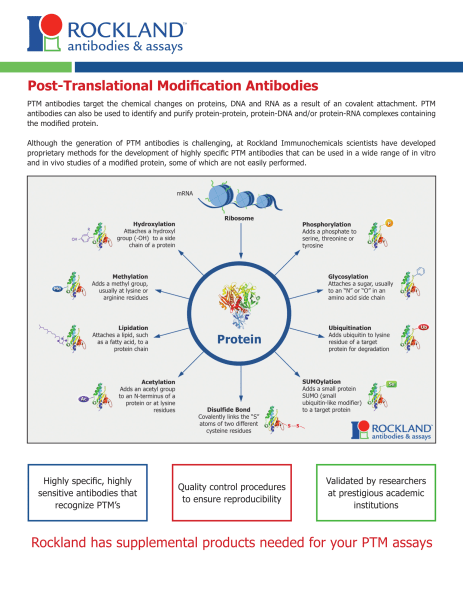 Although the generation of PTM antibodies is challenging, at Rockland Immunochemicals scientists have developed proprietary methods for the development of highly specific PTM antibodies that can be used in a wide range of in vitro and in vivo studies of a modified protein, some of which are not easily performed. Released April 2016. 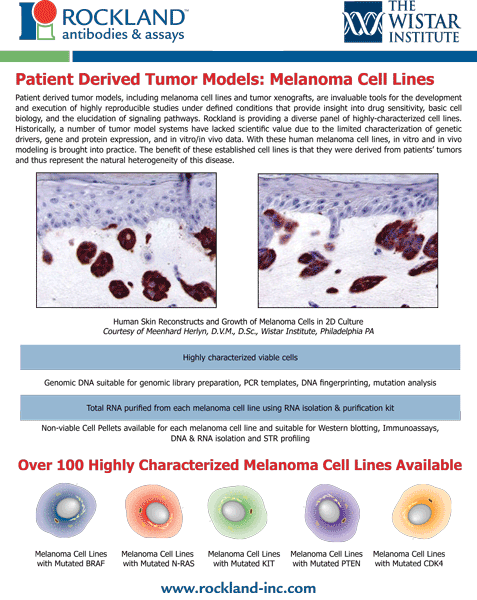 Rockland Immunochemicals Inc. has partnered with The Wistar Research Institute, to produce, validate and distribute a diverse panel of low passage melanoma cell lines from freshly excised metastases. Released February 2016. 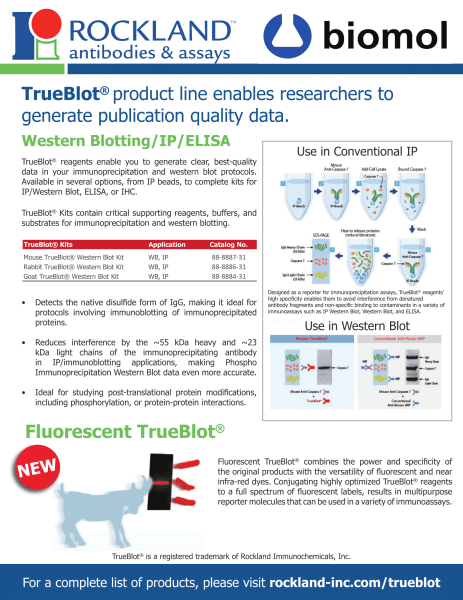 TrueBlot® reagents enable you to generate clear, best-quality data in your immunoprecipitation and western blot protocols. Available in several options, from IP beads, to complete kits for IP/Western Blot, ELISA, or IHC. Released June 2014. 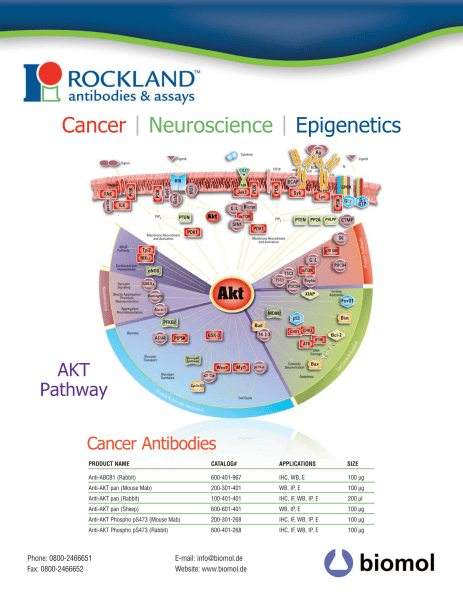 List of Rockland antibodies targeted for Cancer, Neuroscience and Epigenetics research. Released April 2013.